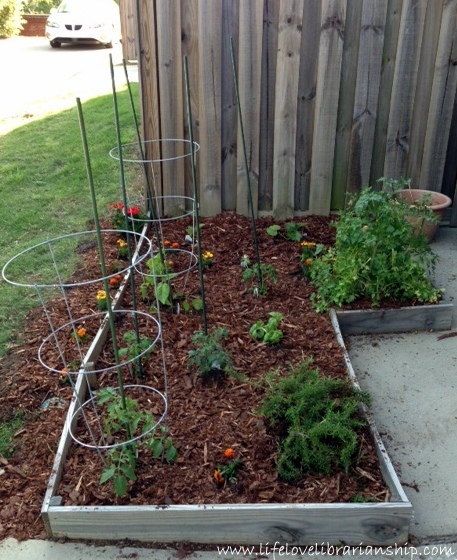 I got my garden in this weekend! I meant to do it last weekend but chores, errands, and rain got in the way. We had beautiful spring weather on Sunday so right after church, I made my way to Home Depot and then to my favorite local nursery and stocked up. As this is my third year planting a garden, the soil needed a little bit of work to get it ready. Last month, my dad brought over several bags of cow manure and we tilled up the soil, removed the rocks that seem to grow during the winter, and spread the manure. This year I’m taking my own advice and only planting one basil plant. The last two years have left me with more basil than I could ever dream of eating, so hopefully this one will be a good producer and I can keep up with the growth. I also pulled up one of my parsley plants. They were both so huge (over 2.5 feet tall!) that one was starting to chock the other. Plus I needed the room to be able to grow everything I wanted to grow this year. My rosemary from two years ago is still doing fabulously. This year I planted zucchini, cucumbers, eggplant, and five varieties of tomatoes – black cherry, sweet 100s, better boy, German giant, and beefsteak. I’ve also got some marigolds in as they attract the right kind of bugs. My garden is small so I only planted one plant of each, but if last year is any indication, I will be getting tomatoes until the first frost. I’m hoping to have better luck with my cucumbers and zucchini this year as last year was very disappointing. I think I ended up with maybe 5 of each and had to pull the plants before high summer because they stopped producing. I think I may have had a problem with bugs, so I’ll have to do some organic pest killing. I’ve found some good recommendations on Pinterest. I also don’t know if I should stake or cage my cucs and zucchini. Any suggestions? I’ll try to be good about providing you all with some updates throughout the growing season. I’m excited (as is Caty) that I can spend some time outdoors babying my veggies and flowers. 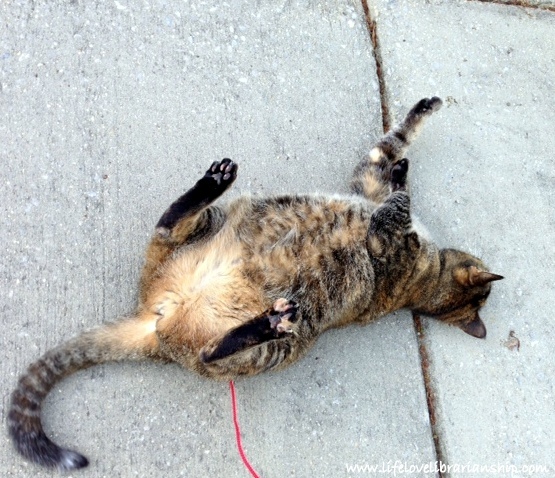 Caty is glad it’s warm so she can snack on grass and roll around on the driveway. 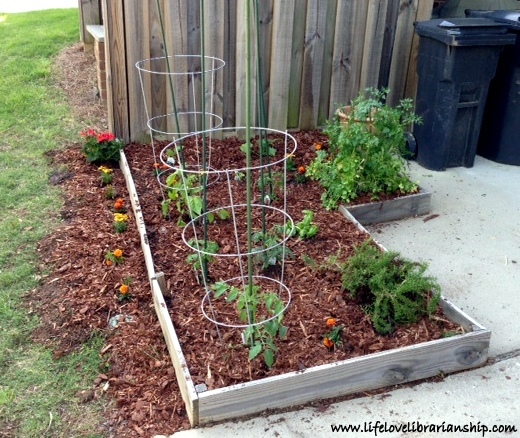 Are planning on a garden this year? 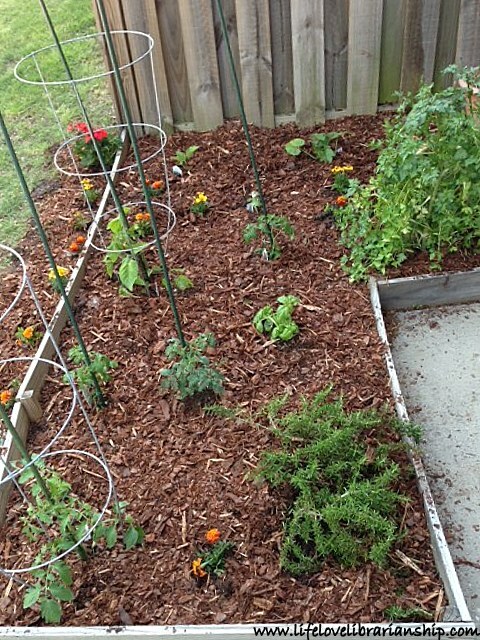 Have you planted anything yet? 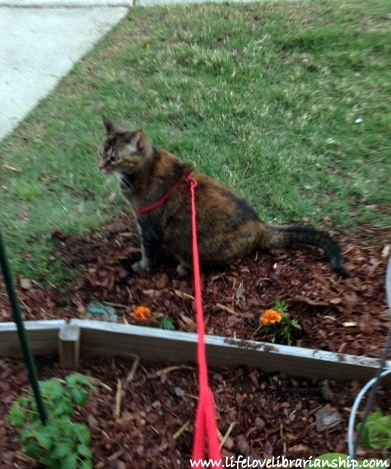 Ok this isn’t about gardening it’s about your cat on a leash. Did you do any training to get your cat comfortable or is she just one of those calm cats who will do anything? 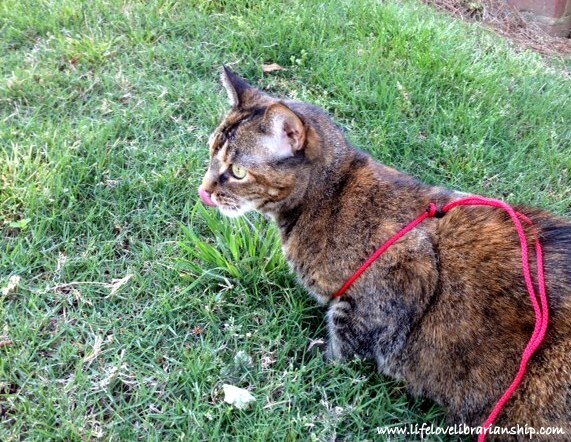 I would love to let my cat outside in the yard but have never tried the leash bit as she is a little skittish. I can’t just let her roam free because she has no front claws. Caty really doesn’t love the harness but I won’t let her out without it because she’s a runner. The first few times I put it on her all she did was lay down and looked at me like “WTF Mom”. But I think she got used to it and now she tolerates it. She does try to climb out every once in a while and it does make her walk funny, but she deals. It’s a simple rope harness I got at Pet Supplies Plus; it doesn’t have a very long lead so she can’t really go far, but it’s enough for her to roam around my little yard and eat some grass. I think get a cheap one and practice with it inside the house a few times before letting her out. And then when you do let her out, carry her outside and put her down in the grass or someplace soft and sit with her while she roams. When she gets used to the outside you can tie it up and putter around while she plays. I’ve never done anything with my zucchini or cucumbers, I just let them grow and they’re usually fine. I do think it helps to have more than one plant though because they produce more male flowers than females so that could reduce their production. Ooo I never thought of that! I might have to go and get another plant. How much space do you leave between your plants? I know they like to spread. Or do you train yours to climb? The cat on the leash cracked me up. My garden is off and running with tomatoes, radishes, and volunteer pumpkins. They are doing great. I just hope I don’t get pumpkins in June and none in September or October. I’m super jealous of your garden (although me having a garden would be pointless because A–I don’t know how to cook vegetables B–Rob doesn’t eat vegetables) but, more importantly, I’m seriously kinda obsessed with Caty’s leash. Cuteness overload. I want to snuggle my face on her–except then my face would swell up and I can only take benadryl. But it would be totally worth it.